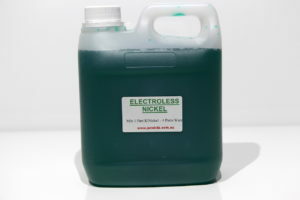 Electroless Nickel as the name suggests is a nickel plating procedure that does not require any electrical current. The chemical plating process which, unlike electroplating, does not require electrical current to deposit the nickel. Nickel is deposited to the surface metal via an 'autocatalytic' process. This process deposits the coating evenly onto the surface being plated. The nickel metal itself is contained in the chemical, and the nickel is plated on to the surface of the parts when they are immersed in the heated plating bath. This is caused by a catalytic action that causes the ions carrying the nickel metal to flow to the part immersed in the bath. 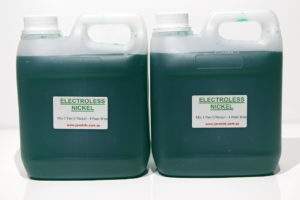 Electroless Nickel comes in liquid concentrate form. The concentrate is mixed with either deionised, demineralised, distilled or rain water. The ratio is 4 parts water to 1 part Electroless Nickel chemical. This type of nickel plating produces a very attractive even nickel plated surface, which also readily plates inner surfaces or into holes. It also has a high phosphor content that improves the corrosion resisting qualities of the plated surface. Electroless Nickel is ideal for motorcycle spokes or odd shaped parts and is a simple process that produces a first class result. Parts will plate in 15 minutes however, best results the recommended time would be 45 minutes to 1 hour. It is designed to plate directly onto steel, cast iron and copper surfaces. It will not plate directly onto brass, stainless steel, zincated aluminum, nickel or die cast zinc surfaces without a separate strike. 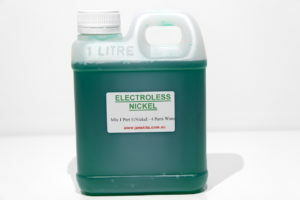 The Electroless Nickel electrolyte or chemical needs to be at an optimum temperature for successful plating. The ideal temperature is 88 to 92 degrees Celsius. This means you will need to heat your Electroless Nickel chemical. The best way to achieve this is placing your chemical into a stainless steel container and externally heating it with a naked flame. (small gas portable camping stove is ideal). The temperature needs to remain within this range. A thermometer will be needed to manage this. An LCD thermometer is available from our online shop. Due to the operating temperature required, Electroless Nickel will evaporate quickly. This is the only negative element regarding this process. Water can be added to top up the chemical levels but it is recommended to purchase more chemical than required so you can top up the bath with more chemical to keep the correct nickel content. With all Jane Kits products, the key to successful plating is in the preparation of the items to be plated. Parts must be chemically clean. In order to ensure that you get pleasing and consistent results Jane Kits sell very efficient Cleaner Kits (see cleaners). Thorough cleaning is essential in the preparation of parts prior to electroplating. The contents you receive will be in container/s, with various chemicals mixed together and the entire contents should be mixed with water at a ratio of 1 part Electroless Nickel to 4 parts water. Therefore if you order a 1 litre mix, you will receive a 1 litre bottle of chemical that should be mixed with 4 litres of water to make a 5 litre final volume plating bath. only use deionised, demineralised, distilled or rain water to create your plating bath. Do not use tap water. It may have too many additives that will contaminate your bath. Electroless Nickel is designed to plate directly onto steel, cast iron and copper surfaces. Electroless Nickel will not plate directly onto brass, stainless steel, zincated aluminum, nickel or die cast zinc surfaces without a separate strike. Jane Kits supplies an Ultra Strike Plating Kit that is a non-cyanide, alkaline Copper Plating process that is designed to plate onto these metals and will act as a strike for Electroless Nickel. (see ‘Electroplating Kits’ for more information on Ultra Strike Plating. resulting from the improper storage or lack of your safety markings on our products. Care should be taken by the bath operator no matter what type of bath is being used. Avoid allowing chemicals to remain on your skin for long periods. Safety glasses and clothing that covers arms and legs should also be worn. A well ventilated room is necessary and avoid inhaling fumes that are present during the plating or mixing processes. A suitable respirator is recommended.